Pennsylvanians do not like Governor Corbett. Here's why. Harper Polling took the pulse of Pennsylvania voters at the beginning of July, and the results are not at all astonishing: people hate Governor Corbett. The poll showed that only 24 percent think that Corbett "deserves" re-election. A whopping 56 percent think the governor doesn't deserve re-election. Drilling down into the numbers doesn't help Corbett's case, either. Twenty-five percent of independents think he deserves re-election, as do only 32 percent of self-identified conservatives. And Harper Polling is generally considered a Republican polling firm. Forget about all the recent legislative defeats Corbett's suffered -- liquor privatization, the transportation and pension bills -- and forget about him passing a budget that doesn't require raising taxes, which, according to the Harper poll, people like. The day-to-day sausage making doesn't really permeate the general voting populace, despite what a number of pundits are telling you. Nope. 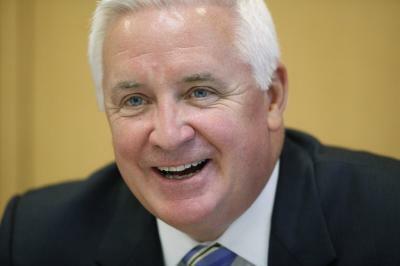 Corbett's approval boils down to two issues: education and health care. You already know about the effects of Corbett's disastrous education policy on the Erie School District. Corbett targeted poorer school districts – like Erie's – for the biggest cuts, which forced the city school district to make big cuts, increase class size, engineer creative lease agreements, and pursue school consolidation. School districts across the state were similarly hit, and property taxes everywhere shot up to cover the education funding deficits. Despite the governor's claims otherwise, the educational budget cuts were not necessary. Funding sources were available to the state that would have allowed Pennsylvania to avoid most, if not all, of the cuts. And health care – the Obama health care reform bill has become a bit of a kicking post for angry Republicans. In the U.S. House, Republicans have for years been putting aside important business to vote repeatedly to repeal the bill, despite the lack of support in the Senate. Here, in Pennsylvania, the Republican legislature and Corbett administration are loath to approve of Medicaid expansion, as part of that bill, despite the same Harper poll showing a plurality of Pennsylvanians supporting it – even if you label it "Obamacare." Education and health care matter tremendously to everyday Americans. If you're an ideologue who bristles at free, universal education and would rather invest in the extraction industry than our children, you will deserve the poor polling numbers you generate.